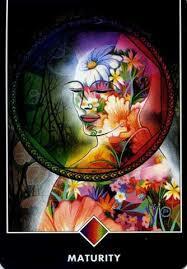 “Maturity” is the Osho Zen Tarot Card of the Week for August 18 – August 24, 2014. Commentary on the Card: This figure stands alone, silent and yet alert. The inner being is filled with flowers–that carry the quality of springtime and regenerate wherever he goes. This inner flowering and the wholeness that he feels affords the possibility of unlimited movement. He can move in any direction–within and without it makes no difference as his joy and and maturity cannot be diminished by externals. He has come to a time of centeredness and expansiveness–the white glow around the figure is his protection and his light. All of life’s experiences have brought him to this time of perfection. When you draw this card, know well this moment carries a gift–for hard work well done. Your base is solid now and success and good fortune are yours for they are the outcome of what has already been experienced within. Meaning of the Card: The distinction between the grasses and the blossoms is the same as between you not knowing that you are a buddha, and the moment you know that you are a buddha. In fact, there is no way to be otherwise. Buddha is completely blossomed, fully opened. 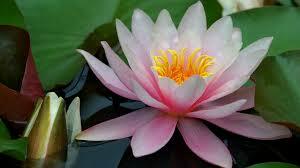 His lotuses, his petals, have come to a completion…. Certainly, to be full of spring yourself is far more beautiful than the autumn dew falling on the lotus leaves. That is one of the most beautiful things to watch: when autumn dew falls on the lotus leaves and shine in the morning sun like real pearls. But of course it is a momentary experience. As the sun rises, the autumn dew starts evaporating…. Congratulations on the wonderful progress you have made! Interested in deepening your experience? I would be happy to assist. 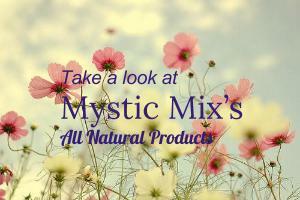 Contact me to schedule Counseling and/or Reiki sessions at: Laura@mysticmix.com, or (801) 366-4469.